Step outside on a sunny morning and if you’re lucky, you’ll hear the low pleasant hum of bees going about their daily work of collecting nectar and pollen. 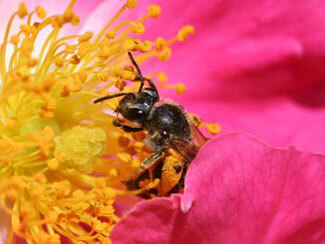 As they do, they transfer grains of pollen from flower to flower, a process many plant species rely on for survival. In the vegetable garden, pollination is more important for some plants than for others. Crops grown for their leaves (lettuce, cabbage, basil) or roots (carrots, radishes, onions) don’t require good pollination to produce the part of the plant we want to eat. But to develop fruit (peppers, melons, zucchini) or seeds (corn, dry beans, grains), plants need to be pollinated. While those busy bees are the most visible signs that pollination is happening, not all vegetables need bees for pollination. Wind-pollinated vegetables – Corn, beets, chard, and spinach depend on the wind to carry their pollen from plant to plant. Beets, chard, and spinach are grown for their leaves and roots, so ensuring pollination isn’t essential (from the standpoint of the human gardener and cook, anyway). Corn, however, requires a transfer of pollen from the tassels to the silks in order to form ears of plump, full, juicy kernels. For this reason, corn should be planted in blocks at least four rows wide rather than one or two long rows, so each plant is surrounded by the maximum number of other, pollen-releasing, plants. Saving seed from wind-pollinated vegetables is difficult, as the pollen can travel great distances, crossing with other varieties or even related wild species. Self-pollinated vegetables – The flowers of self-pollinators contain both male and female parts, so that pollen transfer can easily take place within the flower without needing insects or wind to spread it around. Beans, peas, tomatoes, eggplants, lettuce, and peppers are usually self-pollinating – saving seed that will produce a plant just like the parent plant is easy with these, because cross pollination is much less likely. However, it’s still possible that insects will still manage to transfer a little pollen between varieties, so if you plan to save seed, it’s a good idea to separate different varieties by at least ten feet. Squash will cross within species, so plant only one variety of each species if you plan to save seed. 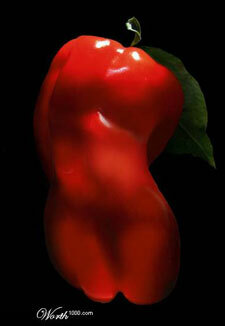 Peppers, while usually self-pollinated, can be visited by bees or other insects which carry the pollen around. For seed saving, plan to separate varieties (fifty feet apart should be okay for home gardening purposes). Sweet and hot varieties, especially, should be planted apart from each other, or you may get an unexpected blast of heat from a supposedly sweet pepper next season. Dedicated gardeners have many tricks for manipulating pollination, like placing bags over flowers to isolate them and then hand-pollinating each one, but these general rules should get you started planning what and where to plant in order to save your own seed for next season. Sometimes gardeners report that planting similar vegetables next to each other (like cucumbers and melons, or hot peppers and sweet peppers) result in funny-tasting fruits and wonder if cross-pollination affects the current generation of vegetables. According to our research, this isn’t the case (corn and other “seeds” being the exception); the results of crossing will only show up in the seed (which includes information from both the male and female parent) and not the flesh (which includes information only from the female parent) of a fruit. Those funny-tasting cucumelons or watercumbers are probably suffering from some sort of disease, not cross-pollination. The possible exception seems to be with hot and sweet peppers – one gardener suggests that we may taste a little hotness in a sweet pepper that has cross-pollinated with a hot pepper if you eat the whole pepper, because the heat of a pepper is in the seeds. We’d love to hear back from anyone who has information that supports or disproves any of these ideas! Learn how to nurture pollinators in your garden by reading about the Plight of the Honeybee, an article by Ann Lovejoy.